So how do I become a doula? So, How Do I Become a Doula? International Doula Institute has made it very easy to become a doula, a competent, confident doula. Our doula training program, including the online learning portal have made it so that all you have to do to become a doula is follow step by step instructions. There are a total of about 100 steps and each one is checked off as you go along for you. So you don’t have to keep track of what you’ve done, the system is set up to do that for you. First you will fill out the online “Enroll Now!” Application. This is free. Our admissions director will review your application to ensure it meets our standards. You will then receive a letter of admission back from admissions. The letter of admissions inviting you to join the online doula training and certification will include a link to select your payment plan and make your first payment. If you select a payment plan, it will automatically be billed to you the same day each month for the number of doula training payments you selected. Once we receive your payment, our admissions team send you a link to log into the doula school online learning portal. You will have to put your name in, select your username and password and that’s it! You’re in! Once you are logged into the online doula training, you’ll be able to go step by step through the online training. You can go as fast or as slow as you need to, as this is a go-at-your-own-paced approach to doula training. 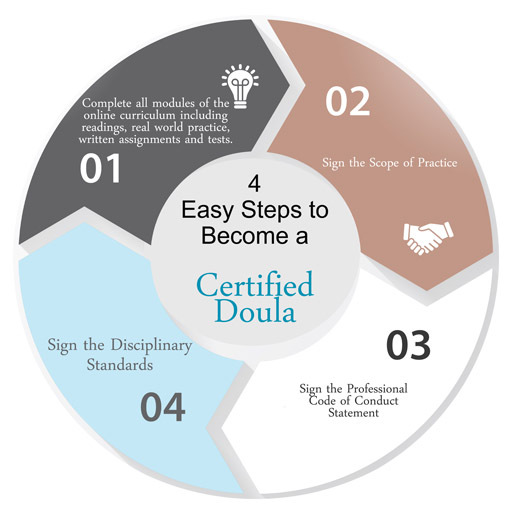 Once you’ve completed the online doula training portion, you will then feel confident enough in your knowledge base and understanding of the job to jump in to working as a birth and/or postpartum doula. Once you’ve completed the experiential portion of your training, the last thing we do is completely evaluate your essays, short answers, multiple choice response, video responses and the client evaluation. If it is done satisfactorily, you will be issued your doula certification credentials notated as CPD or CBD next to your name. Becoming a certified doula at International Doula Institute is as easy at ABC! How to become a doula!